The 2018 Chemistry Faculty Jobs List (curated by Andrew Spaeth and myself) has 399 positions. On October 30, 2016, the 2017 Chemistry Faculty Jobs List had 442 positions. The Academic Staff Jobs List: 40 positions. The Academic Staff Jobs list has 40 positions. ...Washington Suburban Sanitary Commission (WSSC), which serves 475,000 Maryland customers just outside of Washington, D.C., filed suit on Oct. 19 in U.S. District Court for the District of Maryland, charging that seven alum makers—including General Chemical, Chemtrade Chemicals, Geo Specialty Chemicals, and Kemira—rigged bids and allocated customers among themselves between 1997 and 2011. WSSC says the scheme raised prices it and other U.S. utilities paid for alum through 2016. At least 68 other civil suits based on alum price-rigging allegations have been filed in federal court to recoup costs, WSSC says. Others suing alum makers include the Illinois-American Water Co., which filed its suit in April. In June, the cities of Baltimore and Richmond, Va., which supply water to their residents, also filed suits. WSSC is asking the firms named in its suit for $5 million in compensatory damages and additional damage to be determined in a trial. Whenever I think of price fixing cases, I can't help but think about that goofy ADM lysine case. Who knew that the plan to preserve profits extended to alum? Interesting write-up by Linda Wang of the Heroes of Chemistry celebration in DC this fall. Over at Common Organic Chemistry, there's 14 new positions posted for October 29. Shakeup at the Office of Research Integrity? "Scientific Conferences Are Filled with Spies"
or, "yet another misleading headline"
The latest from Stellen für Chemiker. The Medicinal Chemist Jobs list has 131 positions. Over at Common Organic Chemistry, there's 23 new positions posted for October 22 and October 24. The Process Chemistry Jobs List has 82 positions. How is your economy going? So looks like things are kinda going vaguely okay. It's not clear to me that US GDP will break out of its 2-3% range any time soon. So here's my question for you? How is your economy going? Mine is going all right - we are (my family is) keeping our heads above water, and 2018 looks to be fine. So, readers, are you getting hired? Decent pay? How about your friends? Are they finding positions? How is your organization (academic institution, company, etc) doing? Any layoffs in the present/future? How is your economy going, readers? 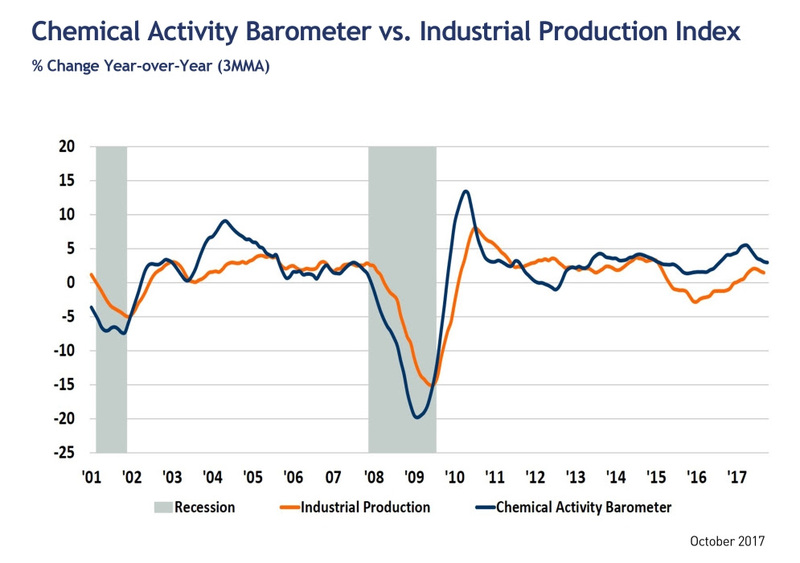 BLS projects 6% job growth for chemists for 2016-26; all job growth remains at 7%. 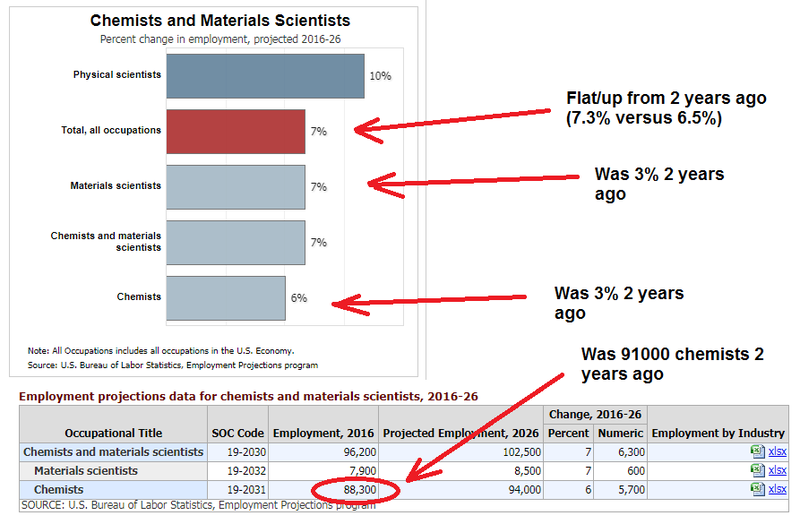 I'm traveling at the moment, so I haven't had a chance to fully absorb these new numbers, but it looks like that BLS is revising its estimate of chemist job growth up from 3% in the 2014-24 decade to 6% in the 2016-26 decade. I think that's good news, but not really particularly exciting (~260 new jobs a year for a decade.) I guess that's better than a kick in the shins, but not much. I think the worse news is that BLS doesn't really see any major job growth (in the double-digit range, say) during the next decade. 2 years later, and their best guess at job growth for the decade is 7%. The 2018 Chemistry Faculty Jobs List (curated by Andrew Spaeth and myself) has 374 positions. On October 23, 2016, the 2017 Chemistry Faculty Jobs List had 415 positions. Condolences to his family, friends and coworkers. The indictment charges that marketing professional Jerry Jindong Xu, who worked for Chemours and its former parent DuPont between 2004 and 2016, intended to use the stolen information to convince Chinese investors to export sodium cyanide and later build a competing plant in North America. Sodium cyanide is widely used to extract gold from ore. Demand for the potentially deadly chemical has been on the rise as consumption of the precious metal increases. Earlier this year, Evonik Industries and Grupo Idesa opened a 40,000-metric-ton-per-year sodium cyanide facility in Mexico. Chemours announced plans for a $150 million plant in the Mexican state of Durango. The indictment charges Xu with conspiracy to commit theft of trade secrets. If convicted, he faces 10 years in jail and a $250,000 fine. “We are committed to prosecuting anyone—be they rogue actors or foreign nations—who tries to line their pockets” by stealing trade information, says David Weiss, acting U.S. attorney for the District of Delaware. Xu’s lawyer tells C&EN he has no comment. Interesting article by Deirdre Lockwood on naturally occuring organohalogen compounds. Will be interesting to see if the bioanalytical chemistry majors get picked up by pharma employers. Lots of comments, unsurprisingly, on the cover story on sexual harassment in academic chemistry. 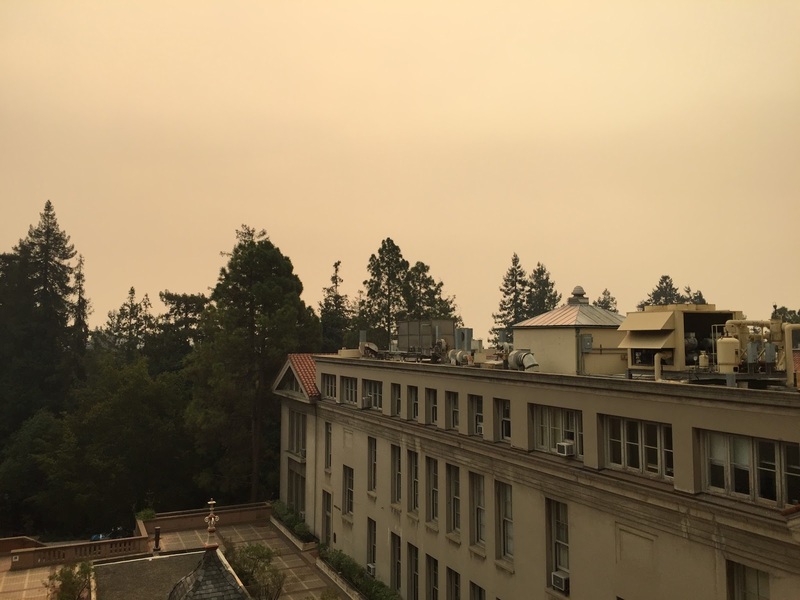 From an anonymous reader: "View from UC Berkeley Chemistry building with all the ash in the air from the Napa fires." Chinese Ph.D.s not coming to the US? For the past 30 years or so, postdoctoral researchers from China have played an important role in chemistry research groups at universities in the U.S. Many research groups feature one or more graduates from Chinese universities who are in the U.S. to further their knowledge. But the supply of Chinese researchers is starting to dry up. Hao-liang Zhang, a soon-to-be graduate who has focused on glycosylation during his doctoral studies at Shanghai Institute of Organic Chemistry (SIOC), offers a perspective typical of graduating Ph.D.s regarding the pursuit of a postdoc in the U.S.
“I would be older when I return to China, and probably less attractive to potential employers,” says Zhang, who hails from the southwestern Chinese province of Sichuan. On the other hand, he can work in China right away and live close to his home too. A pharmaceutical company based in Chengdu, Sichuan, approached him recently. “The talks went well, and they offered me an attractive salary.” Zhang will relocate to Chengdu soon after defending his thesis next month. No one tracks the number of Chinese nationals doing a chemistry postdoc in the U.S. The U.S. National Science Foundation’s National Center for Science & Engineering Statistics does, however, count how many Chinese students who obtain a chemistry Ph.D. in the U.S. plan to stay in the country for a postdoc. By 2015, that number had dropped by 30% from 2005. ...SIOC, meanwhile, has essentially rebuilt all its buildings and retooled its laboratories over the past decade. Students and faculty now work in new and extremely well-equipped facilities. “Of course, we are focused only on organic chemistry,” says Biao Yu, a deputy director at SIOC. “But from what I myself saw, and from the reports of our students who are now in the U.S., we are better equipped than most of the U.S. Ivy League universities,” he says. When he was a student at SIOC in the 1990s, the institute had only two nuclear magnetic resonance spectrometers. Today, the institute has 30. That's a lot of NMRs! I think it will be interesting to see if the trends shift, and which levels of Chinese industry and academia will be influenced by staff who have spent their time in the United States (and other research-intensive nations) and those who have been solely domestically trained. Which generation will be more influential in driving the course of Chinese chemistry? Lots of opinions about whether chemists should be taught coding. Some dude yapping about performance reviews. Disclaimer – I went to University of Minnesota for chemistry graduate school. This trend will only accelerate in the future. In older days, say – the 1970’s, there was more parity in chemistry. Funding was easier to get and students from second & third tier graduate schools might not become professors at R1 universities, but they were likely to find a industry job somewhere – even without a postdoc. With the contraction of pharma in the United States, one essentially needs a PhD/postdoc from an top-tier, elite institution to find an industry job, let alone even consider a tenure track job. When funding at second and third tier universities dries up, the New York Yankees (Harvard, MIT, Stanford, Scripps) of the academic world can use their deep pockets to poach away the top tier professors. Top tier professors will want groups the size of Phil Baran or Barry Trost – they don’t want to be limited to 3-10 graduate students at a Midwestern university. Assume for a moment that academic funding was stable or even growing to support Midwestern schools. Disregard being a tenure-track professor at the University of Minnesota, Northwestern, or University of Kansas (if you’re an assistant TT professor there, you came from Harvard/Stanford/Scripps). Where are you going to work? Pfizer destroyed the pharma employment scene in the Midwest. Essentially all that remains is Eli Lilly in Indy & AbbVie in Chicago. Eli Lilly isn’t doing too well & while AbbVie isn’t tanking – it can’t absorb all of the chemistry grads in the Midwest. The top tier & even the second & third tier students will flee for the coasts because that is where the jobs are and the best schools. There are some places to work in the Midwest for chemists, but not nearly as many as the coasts. The Midwest (sadly) is a second tier place for chemists work and go to graduate school in chemistry. This just exacerbates & accelerates the trend. This is mostly a cri-de-coeur about pharma (i.e. the fate of industrial medicinal/process chemistry in the Midwest), which I mostly agree with and have been emphasizing on this blog for a while. All of this money would be for institutions outside the coasts. The development of clinical compounds, etc. would be required to also be done in the Midwest, including all manufacturing. This doesn't have a snowball's chance of happening, but if I were the chair of the Senate Appropriations Committee, this is what I would be designing. How many applicants there are for entry-level TT positions? Each year, about 2,500 people graduate with a Ph.D. in chemistry; in 2015, it was 2,675 according to the Survey of Earned Doctorates. Of those, 826 (30%) got a postdoc and 478 (18%) got jobs. (Of the 478 who got jobs, 70% went into industry and 22% went into academia.) The rest (936 people) were still looking for a position, either in industry or academia. I am going use 2015 as my model year - this is probably wrong. Assumption 1: of those remaining as Ph.D./not-postdocs, 60% apply for industrial positions, 40% apply to academic positions. Assumption 2: of postdocs remaining, 50% apply for academic positions. Assumption 4: postdocs drop out of the running after 4 years. So it quickly becomes a question of "how many postdocs are remaining on the market after X number of years?" And so through quick math, my guesstimate is 2430 applicants at any one time (number of graduate students applying + 2016 postdocs + 2015 postdocs + 2014 postdocs + 2013 postdocs.) After you add in more grad students and all the international postdocs, etc., I bet you wander into the 3000-3500 range, but that's just a guess. Through random clickings, I found this video of Dr. Laufer talking about democratizing pharmaceutical compound synthesis. It's an... interesting talk, but when you're talking about making API and considering TLC as sufficient proof of purity.... maybe you have some more thinking to do. The 2018 Chemistry Faculty Jobs List (curated by Andrew Spaeth and myself) has 354 positions. On October 17, 2016, the 2017 Chemistry Faculty Jobs List had 401 positions. Over at Common Organic Chemistry, there's 15 new positions posted for Sunday, October 15. C&EN BrandLab produces sponsored content on the behalf of advertisers in Chemical & Engineering News. The custom content studio is seeking freelance writers with credentials in organic chemistry who can tell compelling, engaging stories with a sharp eye for technical accuracy. If you'd like to write for C&EN BrandLab, please get in touch with C&EN BrandLab’s executive editor, Raj Mukhopadhyay, at r_mukhopadhyay [at] acs [dot] org. How is the academic market these days? What would you like us to cover? Some topics will be pre-chosen, some are up to you. The Research Scientist is responsible for developing new methods and improving existing processes for the Aegis Laboratories. Discuss research results with technical staff..
A very nice blogpost by Roman Valiulin over at PerkinElmer Informatic's site on how he makes his infographics. Also, a review of ChemDraw 17 by Martin Stoermer. This book by Mark Lorch and company (including Andy Brunning!) on the science of superheroes looks quite good. Fun post at Science Shenanigans about chemists immortalized in equipment. I thought this article by Rebecca Altman at The Atlantic was depressing, but had some interesting chemistry in it. The same author had a really fascinating post on an old plant that I really liked. The Medicinal Chemist Jobs list has 127 positions. How did the Kobe Steel faking happen? TOKYO — Big manufacturers of cars, aircraft and bullet trains have long relied on Kobe Steel to provide raw materials for their products, making the steel maker a crucial, if largely invisible, pillar of the Japanese economy. ...Kobe Steel said on Sunday that employees at four of its factories had altered inspection certificates on aluminum and copper products from September 2016 to August this year. The changes, it said, made it look as if the products met manufacturing specifications required by customers — including for vital qualities like tensile strength, a measure of material’s ability to withstand a load without breaking when being stretched — when they did not. So here's what I want to know - how the heck was this not caught by the customers? Is metallurgy different than chemistry? Did customers only rely on Kobe Steel's testing? (Do they not have their own QC labs?) Man, that's remarkable if so. How is the market these days? The 2018 Chemistry Faculty Jobs List (curated by Andrew Spaeth and myself) has 331 positions. The Academic Staff Jobs list has 28 positions. Over at Common Organic Chemistry, there's 8 new positions posted for Sunday, October 8. The recent article about rare earths (C&EN, Aug. 28, page 30) reminded me of my work at Ames during the early 1950s. From 1951 to 1953, I worked for Frank Spedding, who was director of both Iowa State University’s Institute for Atomic Research and the Ames Laboratory of the Atomic Energy Commission (now the U.S. Department of Energy). His earlier work in support of the Manhattan Project is well-known. In addition, his interest in the chemistry of rare earths led to the development of ion-exchange procedures that made it possible for us to produce some of the first multigram quantities of high-purity rare-earth oxides by a relatively simple process. Our first work was with 1-inch-diameter, 48-inch-long [2.54-cm-diameter, 121.92-cm-long] glass columns filled with Dowex-50 resin. The distribution of the resin in the columns and the elution rates required careful control to maintain horizontal boundaries between the rare earths as they moved down the column. Initially, the eluant was collected at a drops-per-minute rate into 10-mL flasks, and one of us was in attendance 24 hours a day to change flasks and to make sure no problems occurred. When it was established that high-purity material was being obtained by the procedure, some was converted into metal by Harley Wilhelm in the lab’s metallurgy facility. By 1953 the columns had grown to 8 inches [20.32 cm] in diameter and 10 feet [3.05 meters] in length, and proportionally more rare earths were being produced. Even then we had no sense of the elements’ future importance, and it is interesting to read of their many applications today. It's kinda funny and weird to me that fraction collectors were not available, even in the early 1950s. Nevertheless, pretty cool. I thought this story by Rick Mullin was worth a read on Cambrex. Also, the continuing story of ACS versus SciHub. Looking forward to talking with Dr. Lisa Balbes (of Balbes Consultants LLC, and author of the excellent "Nontraditional Careers for Chemists: New Formulas for Chemistry Careers") on Saturday, October 7 at noon Eastern. Got a cover letter that you'd like us to review (anonymously) live on the air? What would you like us to cover? Some topics will be pre-chosen (e.g. How Do You Define A Chemist? ), some are up to you. 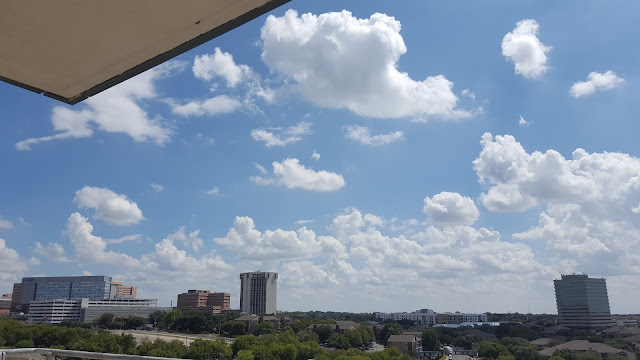 A submission from a long time lurker of the view from the University of Texas Health Science Center. The Medicinal Chemist Jobs list has 124 positions. The Process Chemistry Jobs List has 68 positions. I bet anything this is the first Nobel Laureate to have been interviewed while wearing a "Brawndo" hat. The 2018 Chemistry Faculty Jobs List (curated by Andrew Spaeth and myself) has 317 positions. The Academic Staff Jobs list has 27 positions. I recently sent an e-mail to Dr. Bonnie Charpentier, who is currently running for the ACS President-Elect position to see if she was interested in answering last year's questions for ACS presidential candidates. The most complete resource for ACS members is Career Navigator, which provides a menu of different programs and tools for job-seekers and others interested in exploring career options and professional development. Options under career navigator include offerings such as resume writing, career consulting, professional education courses and links to information about salaries and survey results. One way it could be improved by making sure that members know about it. I think some of our strongest programs involve member-to-member connections and communication. More and more jobs are in small companies, and according to information in the press, including an article in the New York Times, a large percentage of jobs are obtained through referrals. Most of those jobs are not advertised at venues such as national meetings nor in C&EN. We could make it easier for members to share information about opportunities broadly with each other online through ACS. I personally am a strong advocate for strengthening STEM education everywhere for all students to make them more informed as consumers and as the electorate. The advantages of a scientifically literate public are numerous and important. I believe we should provide information to students about potential career paths and provide as accurate information as we can about job prospects in different fields of STEM. Education in STEM can be useful in many different types of jobs and professions. The caveat is that where the jobs are (both geographically and technically) changes over time. I believe students should pursue what interests them and what they love, with as clear an understanding of relevant job prospects as possible. The wages for chemists and other STEM professionals are affected by many complex economic factors, and scientific and technical skills are needed in many areas. What we can do for our members is identify areas where those skills are needed, provide training to help us all stay current technically and develop additional important non-technical skills to improve job prospects. To be successful, any program to influence members’ careers must be sustainable and supported by the actions of more than one individual. All recent ACS presidents have sought to address employment issues for chemists; including, as noted in the question, multiple task forces and reports, some of which provided useful insights. 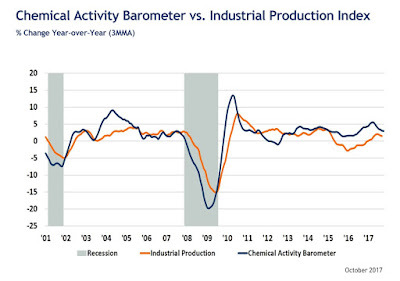 In my industry career I have had to deal with lay-offs and site closures, and I know firsthand that employment statistics showing things are better for chemists than in some other fields don’t mean much to an individual who can’t find a job. On the negative side, it seems unlikely that large corporations in traditional areas will change the pattern of down-sizing and layoffs we have become accustomed to seeing. On the positive side, advances in many new areas of technology require the skills of chemists. Chemists are creating jobs for chemists in start-ups and small businesses. We can advocate strongly for policies that incentivize job creation in chemistry and other fields that are vital to our overall economy and well-being, and that is something I would pursue with vigor. ACS has recently been bringing together CTO’s from big companies for discussions; we can do more to work with small companies and start-ups, and to encourage collaboration between academia and industry. Having spent time on Capitol Hill advocating for chemists and funding for science and education, and in my current job, walking the Hill with patients and patient advocates regarding rare diseases, one thing I’ve learned is that it is more effective to advocate for actions that have understandable human consequences than for esoteric concepts. (Another thing I’ve learned is that it can be more effective to talk with senators and representatives in their home districts than on the Hill, but that is another topic). My priority would be to advocate for funding for science and technology with clear and concrete examples of the importance of that funding to the discovery and development of such things as medicines, energy sources, clean water, new technologies and the importance to our lives and economic well-being. In this time of bitter partisanship, focusing on areas of concrete importance to constituents is one way toward bi-partisan support. I don’t see this as a question of shifting funding from academia to more SBIRs; both are important, and both can be supported by solid and reliable funding, as can grants and educational programs. The most obvious answer is to help our members maintain marketable technical and soft skills through continuing education, leadership, and entrepreneurial training. These are important at any time, but clearly more critical in economic downturns. Our programs must be kept strong, relevant and effective for our members. The ability for members to network and support each other with employment information is also important. A less obvious answer is that to do these things ACS must be sustainable. In my opinion, we could have done a better job with some decision-making during the last recession. After that experience, plans were put in place to establish clear priorities and financial contingencies and it is very important that ACS keep those plans current in the event of another recession to enable the financial sustainability of the Society and services for members. Thanks to Dr. Charpentier for her responses.